This book is my translation work in collaboration with an Indonesian researcher. It is published by Lazuardi Birru and will be available in Indonesia market soon. The book is also available in Malay language for Singapore and Malaysia markets. Law enforcement approach only will not be sufficient to neutralise the threat of violent ideology that fuels current wave of terrorism. The best and lasting antidote is the right understanding of religion based on strong and real conviction. This can be achieved by offering sound and coherent refutations that will empower Muslim mass to resist the ideology and radicals to abandon it. For that purpose, this book has important place and role because it was written by leaders of Egyptian Al-Jamaah Al-Islamiyah, a group that was responsible for various terror attacks in Egypt long before the emergence of Al-Qaeda. 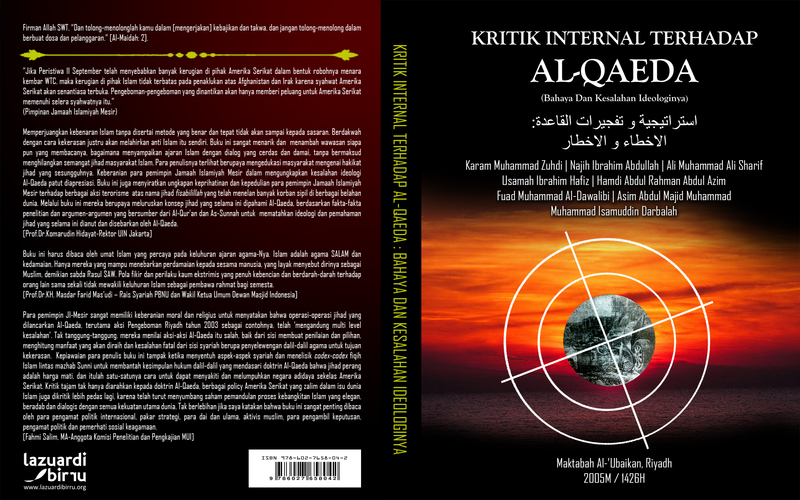 Thus, the book can be regarded as criticism from within the militant circle, although the authors have abandoned their violent ideology that previously inspired Al-Qaeda. The book exposes the fallacies of Al-Qaeda and its allies’ ideology through sound theological arguments. It highlights how Al-Qaeda and its allies have erred in their interpretation of Al-Quran and hadiths (the Prophet traditions), departed from the traditions of Muslim scholars and mis-read current realities. In addition to this, the book also guides its readers to understand the theological arguments and thinking process that support the authors’ position so the readers will incline to the position with full conviction and not blind following. The potency of the refutations offered by leaders of Egyptian Al-Jamaah Al-Islamiyah has been tested when their works succeeded in influencing violent groups in Algeria and Libya to review and abandon their ideology. More than 20 volumes have been published since 1997 till now by the leaders of Egyptian Al-Jamaah Al-Islamiyah for the purpose of reviewing their previous ideology and refuting Al-Qaeda and its allies. This book represents the gist of all the volumes and offers the most comprehensive refutation.